Avocet Cottage in Sheringham, Norfolk sleeps 4 people. 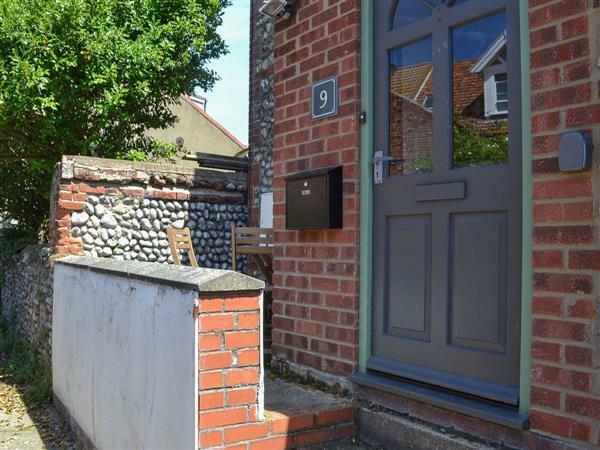 Avocet Cottage in Sheringham is set in a quiet residential row, yet very close to Sheringham’s wide, sandy beach and town centre; Avocet Cottage is the perfect choice for small families looking for a great seaside retreat. Popular with locals and holidaymakers alike, Sheringham offers a good mix of high street and boutique shops, and lots of great places to eat and drink, perfect for satisfying that extra appetite that seems to go hand in hand with all that sea air. In fact, you could walk out and dine somewhere new every evening and still not have tried everywhere, ideal for those hoping not to cook while enjoying their holiday. For those who still like to whip up a meal, this terraced cottage has a generous sized kitchen and even offers a small courtyard for those hoping to dine al fresco. Sheringham itself offers lots of attractions including the North Norfolk Railway, which offers steam train journeys, two museums and 1000 acres of landscaping at Sheringham Park. If you can bear to leave this lovely town, you will find Cromer and its famous pier close by too. Here you will also find a cinema, seaside amusements and a zoo, as well as another lovely beach. In fact, head east or west from Sheringham and you will find a string of seaside towns and villages offering marshes, quays and beaches to be explored. A day out at the Norfolk Broads should beckon too and you can take a train from Sheringham or you can be there by car in just 45 minutes. This mainline train route also leads to the medieval city of Norwich where you will find a splendid Norman castle and numerous museums and galleries to enjoy. In fact, there is just so much to explore, see and do, you are sure to return to Avocet Cottage for another holiday, just to fit it all in. The beach is 100 yards from Avocet Cottage in Sheringham. With the shop and restaurant 100 yards, and the pub is 150 yards from Avocet Cottage. Living room: With 42 Freeview TV, DVD player and wooden floor. Gas central heating, gas, electricity, bed linen, towels and Wi-Fi included. Highchair and stairgate. Welcome pack. Courtyard with sitting-out area and garden furniture. On road parking; additional public car park, 150 yards away, at cost. No smoking. Holidays at Avocet Cottage run from Friday to Friday. Pets allowed at Avocet Cottage. For a better idea of where Avocet Cottage is, you can see Avocet Cottage on the map below. Avocet Cottage is in Norfolk; should you be on the lookout for a special offer, you can find all the special offers in Norfolk. It's always worth checking to see what is on offer at the moment. Do you want to holiday near Avocet Cottage (UKC3425), you can see other cottages within 25 miles of Avocet Cottage; have a look to find your perfect holiday location.